IN THE MIDDLE YEARS OF THE 20th CENTURY, the town of Claremont in eastern Los Angeles County emerged as an important center of modern design. There, distinctive expressions of Modernism evolved and flourished through the interplay of art and architecture. Claremont Modern tells that fascinating story. Architects featured in the documentary include Richard Neutra, Cliff May, Edward Durell Stone, Foster Rhodes Jackson, Theodore Criley, Jr., Fred McDowell, Everett Tozier, John Lautner, Lewis Crutcher, and Carl Troedsson, as well as Millard Sheets, who blazed an alternative path in modern architecture. Claremont Modern also examines several artists who helped design their own homes, including Harrison McIntosh, Karl Benjamin, James Hueter, and Sam Maloof. 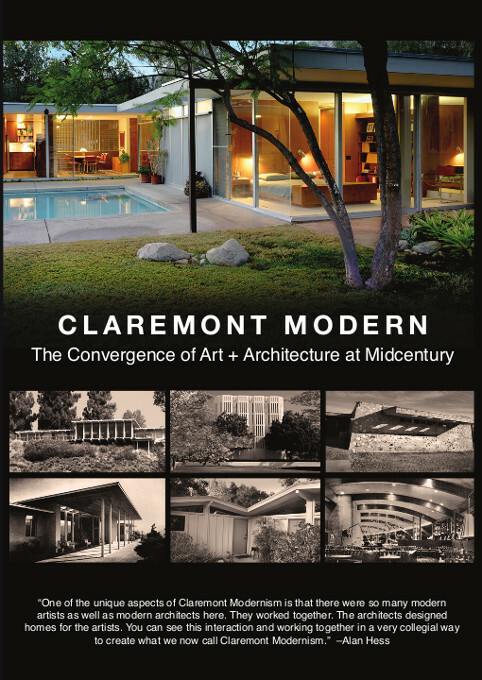 Claremont Modern features commentary by architects, artists, and historians. Commentators include Alan Hess, Adam Arenson, Barbara Lamprecht, David Shearer, Alan Brookman, and Rufus Turner. Further insights are provided by Tony Sheets, James Hueter, Beverly Benjamin, Chris Darrow, Paul Darrow, Catherine McIntosh, Martin McLeod, Brian Worley, Alba Cisneros, Betty Davenport Ford, and Carolyn Sheets Owen-Towle. The documentary was produced by Paul Bockhorst Productions in cooperation with Claremont Heritage. David Shearer was the project supervisor for Claremont Heritage. Running time is approx. 90 minutes. Major Funding for Claremont Modernwas provided by The Ahmanson Foundation and Howard and Robert Ahmanson, The Windgate Charitable Foundation, Brent R. Harris and Lisa Meulbroek Harris, and Tom and Carolyn Owen Towle.